While doing my research for this article, I’ve not only tested both Intercom and Zendesk myself, but also read a pile of different articles, comparisons, guides, showdowns and all this kind of stuff. I mean, I wanted to get a second opinion, too. What really struck me though is that people seemed to like Zendesk more. Not in a bad way, more like in a very neutral ‘huh, this may be interesting’ way. Let me elaborate on this one. I know Intercom. I’ve known Intercom for a while. I used at my previous work, and heck, I liked it back then. One could even say I was being a little bit biased towards Intercom before starting the research (and one would be completely wrong as my heart belongs to HelpCrunch now, but that’s not the point). So when I realized lots of companies actually prefer Zendesk over Intercom, I was surprised. For real. I mean I stumbled upon this article where people from Outreach.io were telling why they’d switched from Intercom to Zendesk, then I saw this comparison, where Zendesk seemed to beat Intercom at the end. And it got me thinking. As it turns, it’s quite difficult to compare Zendesk against Intercom as they serve different purposes and will fit different businesses. Different as in size and goals. But I tried anyway. So, how do these two tools actually compare? Is the winner that obvious or is it more complicated than that? So let’s dive right in. On one hand, Zendesk offers a great many features, way more than Intercom, but it lacks in-app messenger and email marketing tools. On the other hand, Intercom has all its (fewer) tools and features integrated with each other way better, which makes your experience with the tool as smooth as silk. If you’re a huge corporation with a complicated customer support process, go Zendesk for its helpdesk functionality. If you’re smaller more sales oriented startup with enough money, go Intercom. Founded in 2007, Zendesk started off as a ticketing tool for customer support teams. That was their main focus back then. It was later when they started adding all kinds of other tools like when they bought out Zopim live chat and just integrated it with their toolset. Intercom is 4 years younger than Zendesk and has fancied itself as a messaging platform right from the beginning. Intercom lets businesses send their customers targeted in-app messages. The key phrase here is ‘in-app messages’. Oh God, where do I even start. Zendesk is a ticketing system before anything else. Their ticketing functionality is overwhelming in the best possible way. As I’ve already mentioned, they started as a helpdesk/ticketing tool, and honestly, they perfected every bit of it over the years. All interactions with customers be it via phone, chat, email, social media, or any other channel are landing in one dashboard, where your agents can solve them fast and efficiently. 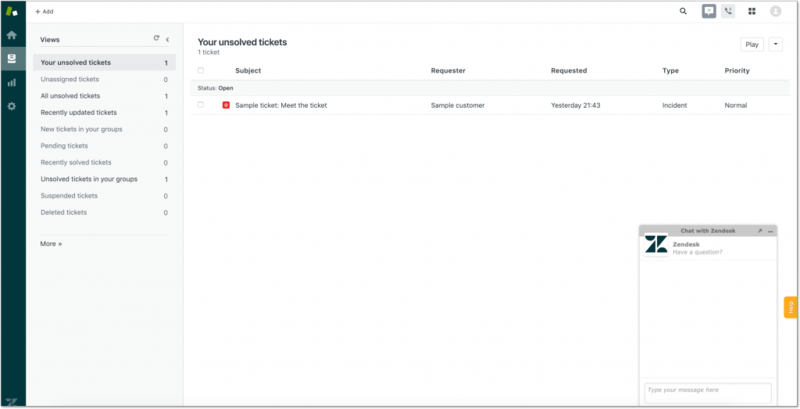 There’s a plethora of features to help bigger teams collaborate more effectively – like private notes or real-time view of who’s handling a given ticket at the moment, etc. All in all, Zendesk is great for its helpdesk functionality. To be honest, Zendesk’s chat widget is not my favorite one. It has very limited customization options in comparison to its competitors. But I don’t want to sell their chat tool short as it still has most of necessary features like shortcuts (saved responses), automated triggers and live chat analytics. Nothing fancy, just usual stuff. The Guide tool from Zendesk is very rich in features. Basically, you can create new articles, divide them by categories and sections – make it a high end destination for customers when they have questions or issues. Intercom is a business messenger in the first place. Their chat widget looks and works just great and they invest lots of efforts to make it a modern convenient customer communication tool. So let’s talk about it first. Also, their in-app messenger is worth a separate mention as it’s one of their distinctive tools (especially since Zendesk doesn’t really have one). 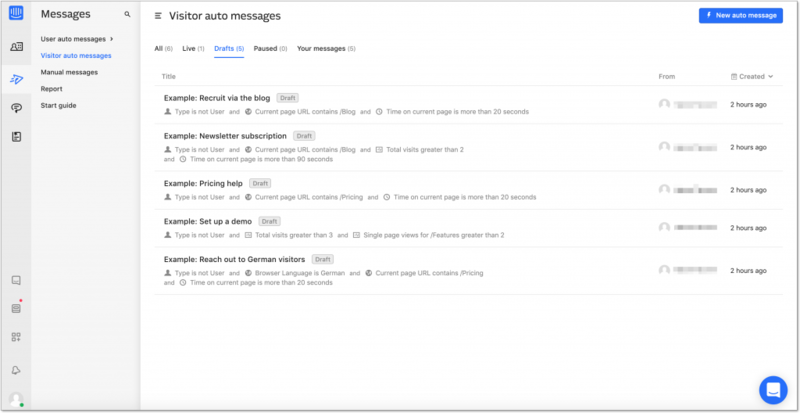 With Intercom you can send targeted email, push, and in-app messages which can be based on the most relevant time or behavior triggers. God do I love Intercom Messenger. It’s modern, it’s smooth, it looks great and it has so many advanced features. I’m pretty sure it’s a benchmark for other chat widgets out there. It’s highly customizable, so you can adjust it according to your website or product’s style. 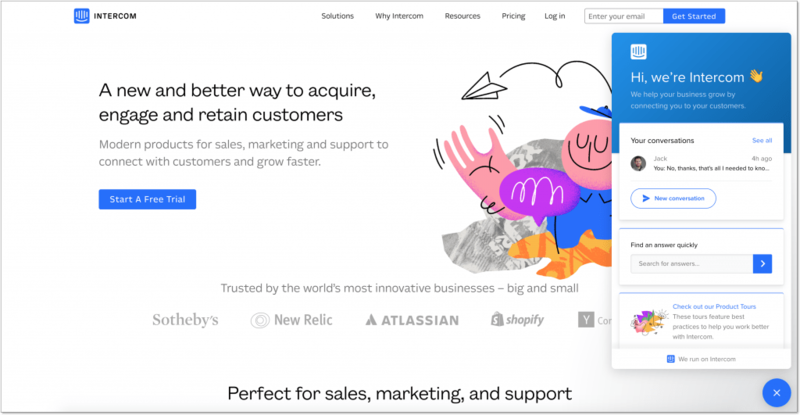 What makes Intercom stand out from the crowd are their chatbots and lots of chat automation features that can be very helpful for your team. You can integrate different apps (like Google Meet or Stripe among others) with your messenger and make it a high end point for your customers. It’s a truly powerful tool. The Help center by Intercom is also a very efficient tool. You can publish your knowledge base articles and divide them by categories and also integrate them with your messenger to accelerate the whole chat experience. Just as Zendesk, Intercom also offers its own Operator bot which will automatically suggest relevant articles to customers who ask for help. If I had to describe Intercom’s helpdesk, I would say it’s rather a complementary tool to their chat tools. It’s great, it’s convenient, it’s not nearly as advanced as the one by Zendesk. 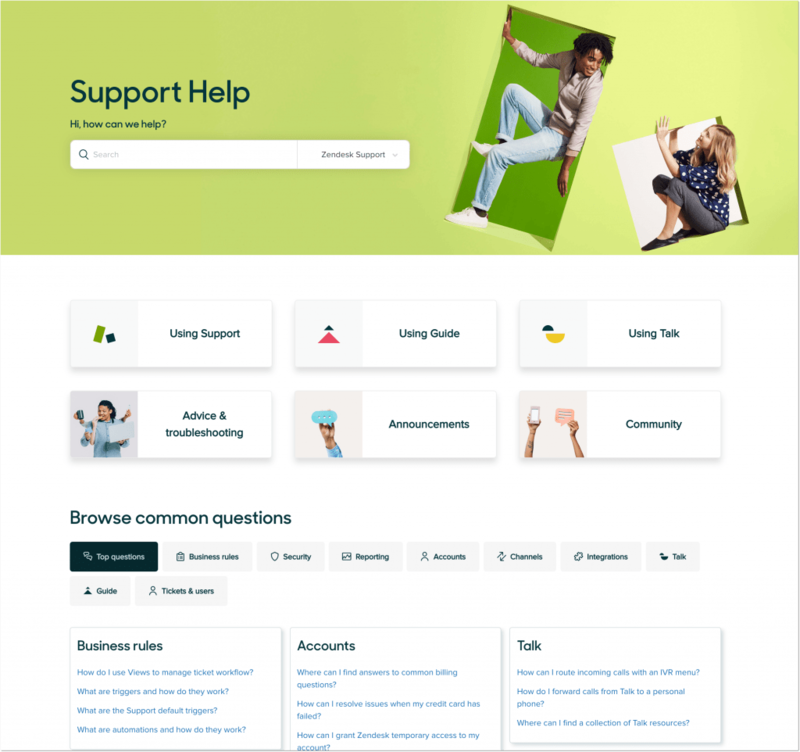 Their helpdesk is a single inbox to handle customer requests, where your customer support agents can leave private notes for each other and automatically assign requests to the right people. I’ve said it about Zendesk chat and I’ll repeat it here. Nothing fancy, just usual stuff. But it’s designed and crafted so well that I can’t seem to get enough of it. So yeah, all the features talk actually brings us to the most sacred question – the question of pricing. You’d probably want to know how much it costs to get Zendesk or Intercom for your business, so let’s talk money now. First things first. If you’d want to test Zendesk and Intercom before deciding on a tool for good, they both provide free trials. Intercom has a standard trial period for a SaaS product which is 14 days, while Zendesk offers a 30-day trial. Not only does Zendesk offer a free trial, it’s actually sort of a freemium tool, which means you can choose one their tools (live chat, knowledge base, call center software) and use it for free forever. As any free tool, the functionalities there are quite limited, but nevertheless. If you’re a really small business or a startup, you can benefit big time from such free tools. Intercom doesn’t really provide free stuff, but they have a tool called Platform, which is free. The free Intercom Platform lets you see who your customers are and what they do in your workspace. So I guess that’s one in favor of Zendesk. As you’ve seen above, Zendesk offers a great many tools. You can subscribe to them in bulk or choose separately. But for some of them (like Explore or Guide) you would need to have the Support subscription already. To sum things up, one can get really confused trying to make sense of Zendesk’s pricing, let alone to calculate costs. But it seems so only at first glance. It’s much easier if you decide to go with the Zendesk Suite, which includes Support, Chat, Talk, and Guide tools. There are two options there – Professional for $109 or Enterprise for $179 if you pay monthly. The difference between the two is that the Professional subscription lacks some things like chat widget unbranding, custom agent roles, multiple help centers, etc. If you thought Zendesk’s pricing was confusing, let me introduce you to Intercom’s pricing. It’s virtually impossible to predict what you’re going to pay for Intercom at end of the day. There are four different subscription packages you can choose from, all of which also have Essential, Pro, and Premium options for businesses of different sizes. You’d need to chat with Intercom sales team for get the costs for the Premium subscription, though. The cheapest (aka Essential) ‘All of Intercom’ package will cost you $136 per month, but if you only need their essential chat tools only, you can get them for $49 per month. At least, that’s in theory. On practice, I can’t promise you anything when it comes to Intercom. They charge by contacts, not by agent seats. Moreover, these are new prices as they’re in the middle of changing their pricing policy right now (and they’re definitely not getting cheaper). What can be really inconvenient about Zendesk, though is how their tools integrate with each other when you need to use them simultaneously. I found that if I wanted to work most productively I’d need to have all four main Zendesk products opened in different browser tabs as there is no option of having all of them within a single dashboard. While using Zendesk for longer than a couple of hours (especially if you do so right after Intercom) you can get a nauseating feeling that its design is a bit outdated and cluttered – especially when it comes to their chat widget and its customization. Honestly, when it comes to Zendesk, it is not the most modern tool out there. Say what you will, but Intercom’s design and overall user experience are leaving all its competitors far behind. I mean, it will just suffice to mention their blog. It’s beautifully crafted and thought through, and their custom-made illustrations are just next level stuff. You can see their attention to detail in everything – from their tools to their website. In a nutshell, both these companies provide great customer support. Basically, that’s all you really need to do. I tested both of their live chats and their support agents were answering in very quickly and right to the point. Zendesk team can be just a little bit faster depending on the time of the day. Though Intercom chat window says that their team typically replies in a few hours, I received the answer in a couple of minutes. Their agent was always trying to convert me into a lead along the way, but heck, that’s a side effect of our job. Zendesk’s customer support is also very fast, though their live chat is only available for registered users. It means you can chat with their team only if you’re Zendesk user, but if you’re only browsing their website, you can contact them only by shooting a message to their sales team and leaving your email address. So yeah, two essential things that Zendesk lacks in comparison to Intercom are in-app messages and email marketing tools. Intercom on the other hand lacks many ticketing functionality that can be essential for big companies with a huge customer support load. At the same time, they both provide great and easy user onboarding and customer support. Both are quite reliable and stable. In terms of pricing, Intercom is considered one of the hardest on your pocket. Zendesk can be more flexible and predictable in this area as you can buy different tools separately (or even use their limited versions for free). To sum things up, Zendesk is a great customer support oriented tool which will be a great choice for big teams with various departments. Intercom feels more wholesome and is more customer success oriented, but can be too costly for smaller companies. proactive messaging to reach out to your website visitors. Test any of HelpCrunch pricing plans for free for 14 days and see our tools in action right away.